I have a 27" iMac (2009) running the OS X 10.6.8 and using the Apple Wireless Keyboard. Since around March or early April, I noticed that the function keys (F1-F9) have stopped working. I think it started with one of the recent software updates. Now, I can no longer control the brightness or media playback with the keyboard function keys. Looking at the on-screen keyboard, it's like the F1-F9 keys are not even registered by the OS. The volume keys (F10-F12) do still work. While I can still control the brightness in System Preferences, this is still a big problem for me because when I try to use the iMac in target display mode with a MacBook Air (2011), the iMac goes to full brightness and I cannot adjust it down anymore with the keyboard buttons like I could before. This makes it unusable as a secondary display. I have tried a lot of stuff but nothing seems to help. I have noticed a few posts on the Apple support forums with similar problems but there doesn't seem to be a resolution yet. Another weird thing I noticed is that now the keyboard defaults seem to be mapped weird - it says that the brightness controls are mapped to F14/F15 when I don't even have those keys. And some of the other functions like Dashboard also got their defaults to different keys. If I try mapping the brightness controls different keys such as F11/F12, I get the "invalid input" beep when I try pressing them. 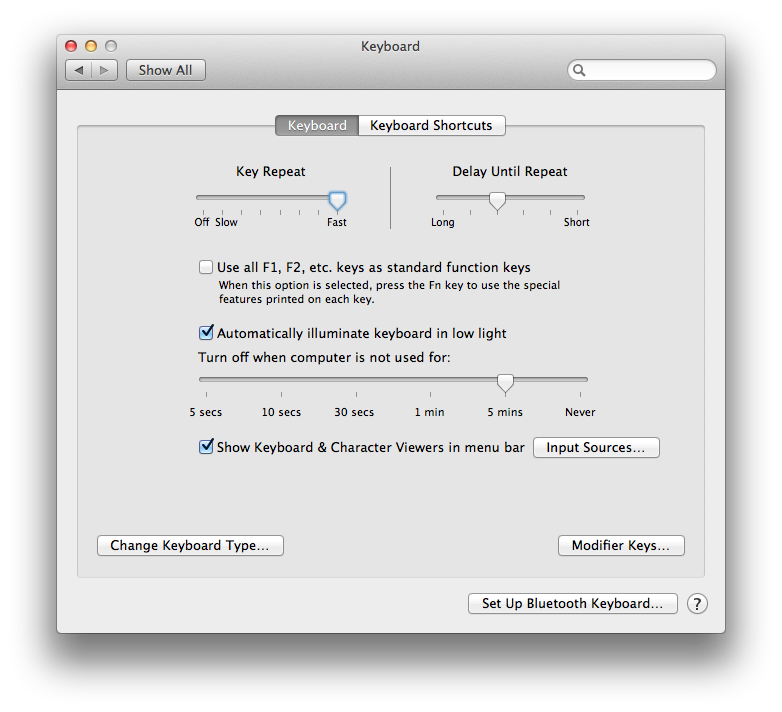 Have you tried Change Keyboard Type in System Preferences -> Keyboard? Not the answer you're looking for? Browse other questions tagged snow-leopard keyboard imac .